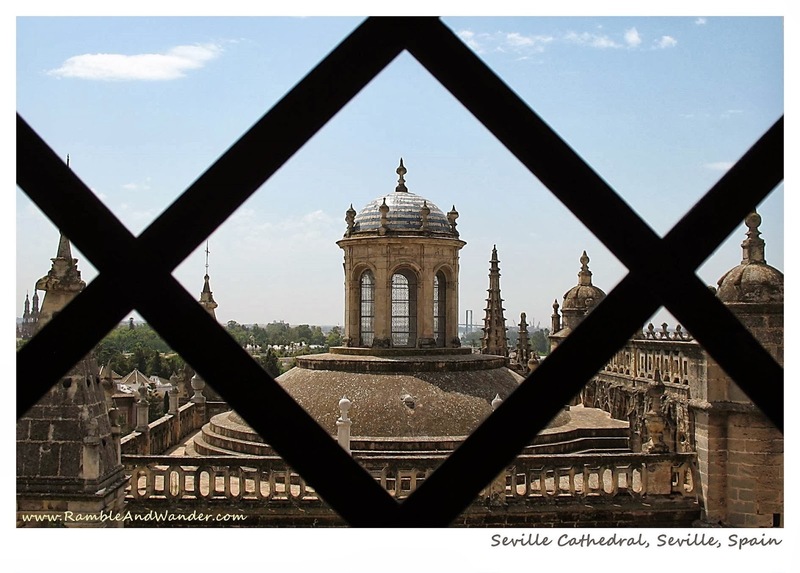 This is the rooftop of Seville Cathedral as seen from the Giralda, the bell tower of the Cathedral. Currently the largest Gothic cathedral and the 3rd largest church in the world, Seville Cathedral's construction began in 1402 on the site of a former mosque. Upon its completion in 1506, it became the biggest cathedral, replacing Hagia Sophia (in Istanbul, Turkey), which previously held the number one spot for more than 1,000 years. The bell tower itself was formerly a minaret that was built in late 12th century based on the minaret of Koutoubia Mosque in Marrakesh, Morocco. Both the Cathedral and the bell tower are a UNESCO World Heritage site. The photo is awesome with the symmetrical theme. And the building itself is a beauty. Full with history and amazing architectural design. I love places like this; it feels like travelling over time, going back to the early years. Spain is my ultimate dream country to visit, what with its heritage, history, cultures, languages and foods..
And I'll definitely do a postcard series like this when I've travelled more than what I currently have..
Spain is definitely a very nice country to visit, in my opinion. Why not start the postcard series now? I'm sure you already have plenty of photos from your previous travels, no? Haa! Just saw it just now, haha!